Listening to God can bring abundance into your life. In John 21, Peter had been out fishing all night and did not catch any fish. Jesus spoke to Peter and told him to shift to the right side of the boat. When he made the shift he was amazed at the 153 large fish that filled his net. What shift do you need to make in your life? God has the keys to unlock the treasures He has for you. Inspired CollageTM a mini retreat – a spa for the soul. 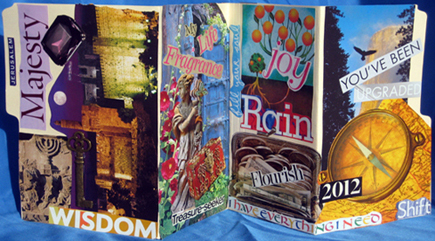 It is a kaleidoscopic blend of practices inspired by Scripture, journaling, meditation, and love for beauty and art. Through the power of images and self-discovery you craft your visual life-journal, creating deeper intimacy with God, yourself and others. (Let your imagination fly upon the truth) You will take home with you a uniquely crafted collage and a creative practice that can be used for your personal Scripture meditation and continued growth. Our time together includes a presentation regarding the highlights and obstacles of creating your life-journey Dream Board. (Some obstacle examples: black and white thinking or negative self-talk, fear of failure or success) Time is given for journaling and connecting with God. You will then choose a Scripture, words and images. During the session 1000’s of images will be provided. You will find yourself gravitating toward images that have a personal meaning for you. Through a process of discovery and revelation, adding and subtracting, a larger story, an illuminated image emerges from the layers. At the end of the workshop, participants will have the opportunity to share their crafted accordion Dream Board and their experience. A safe place is provided for sharing. Come and experience the richness of fellowship and spiritual growth. 2. "I choose life" (Deut:30:18-20) 10 being fully alive, where are you on a scale of 1 to 10? 3. What inspires you? What motivates you? 4. What declarations do you want to claim and declare this year? Peggy is a licensed Marriage and Family therapist in San Francisco, CA. She spent several years as a missionary with YWAM involved in counseling and healing to the nations. Peggy is passionate about her Christian faith and finds great joy helping others unlock the treasures that are placed in them. Her desire is to use Scripture and art for healing. 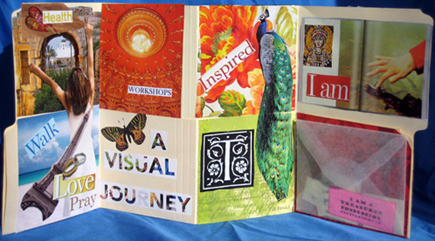 Peggy is an inspirational speaker and has created Inspired Collage™ Workshops. Workshops are available for church groups, woman’s retreats and other Christian gatherings.